Someone asked me why are we running out of ammunition. I simply went to my source, which happened to be the same answer I was thinking anyway. We are merging the three nations: Canada, Mexico and the United States and we’ve decided to all use the same ammunition in all of our guns. To practice our new weapons we need to buy a whole lot of ammunition. That should satisfy everyone in North America. The bad part is that military forces of Canada, Mexico, or the United States can integrate forces. 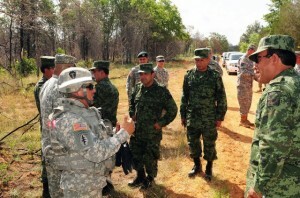 They have been training together and will be training and fighting in combat situations: One example will be using combat soldiers from all three former army forces in order to seize all weapons and ammunition from civilians There will be no private weapons allowed in the New World Order (NORTH AMERICA). REMEMBER: You no longer belong to just the United States. You now belong to North America and you are now a North American. You can live anywhere on this North American continent. (pp, 27,28) Building a North American Community. Did anyone ask your permission to make all these changes?